Professional high quality ranging line with hard wearing frame and a tough braided line which can be locked at any length. Hard wearing grey polystyrene body. Long handle to ensure a secure grip. 1.5mm braided yellow line, coloured throughout its thickness for superior resistance to UV lights. Rotating rewind knob on handle for fast rewinding. 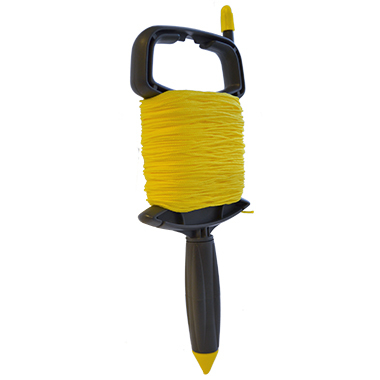 Detachable hand grip allows insertion into a ranging pole. Two locking positions to lock line at any length.